The students in Belmont Instructor Arden Von Haeger’s Illustration course have left an impact on the neighboring Edgehill community through the creation of a mobile art project, now installed at the Midtown Hills Metro Precinct. Community Coordinator Sergeant Raymond Jones approached Belmont’s Art Department months ago with the idea of creating a piece of art to celebrate the neighborhood after seeing a similar piece at 50 Forward, a local nonprofit. After hearing of Jones’s idea, Von Haeger said he was immediately interested and knew his illustration students would jump on board. 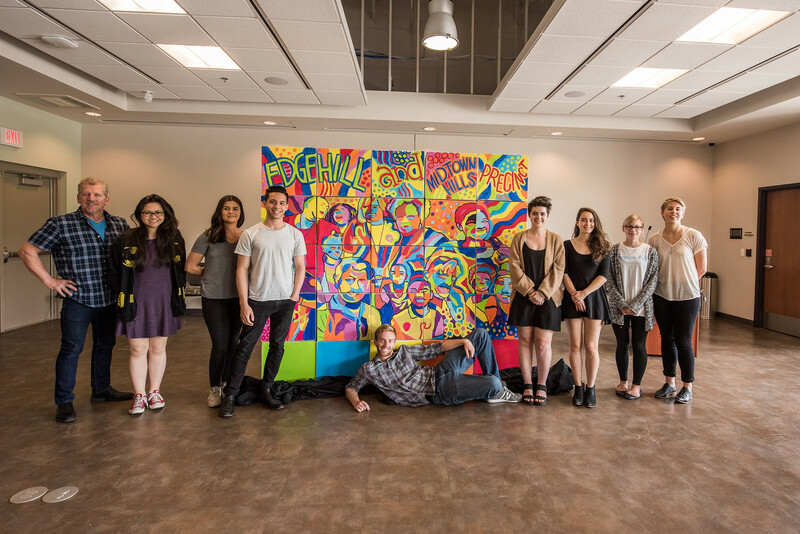 The student’s collaborative piece was unveiled at a celebration on Tuesday, April 19 at the Precinct. Metro officers, community leaders, Belmont students and residents filled the seats as Jones described the project and passed the microphone to Von Haeger before revealing the work. “I wanted us to capture the idea of community involvement that would keep that spirit alive–what better way to do that than through art?” Jones said. The project will be on display at the Precinct until it is moved to other events throughout the community. With additional sides of the boxes used to create the project still blank, Von Haeger and Jones said they have even bigger dreams of continued art projects in the coming months.